This week we continued looking at short and long multiplication. We then moved onto working on long division using the partial table and the chunking method to help us reach our answers. Towards the end of the week we have started looking at perimeter of shape. The perimeter of a shape is all the way around the outside of a shape. To work out the perimeter of a rectangle the children did the Length x 2 + the width x 2, the answer gives the perimeter of the shape. We then looked at area, the area is the inside of the shape. To work out the area of a shape you simply multiply the length by the width. Have a go on this website and see what you know about areas and perimeters of shapes. Last month (as I'm sure all of you are aware) Tim Peake became the first British ESA astronaut to go into space. He has been launched into space to conduct six months of research into microgravity. This week the children have been conducting their own research all about Tim Peake in order to write a biography about him. The children researched this incredible man, and found out he was born in Chichester on 7th April 1972, he is married to a woman called Rebecca and has two sons. He spent 17 years in the army before being selected out of 8000 applicants to go to space! I cannot wait to read all of your biography's and find out some more fascinating facts about him. This week the children have done even more research into our solar system and the planets that make up our solar system. Each child has produced their own fact booklet about a specific planet and they are jam-packed full of interesting information and facts about the planets. The booklets are even up on display so the children can look at eachothers to learn new things! This week the children have investigated orbits the week. We have studied what the meaning of orbit is and that it takes the Earth 365 days and a quarter to orbit the sun, it takes 28 days for the moon to orbit the Earth, and it takes 24 hours for the Earth to spin once of its axis. Today we looked at why the moon doesn't always look the same and why sometimes it appears to have changed shape. We know that is to do with the position of the moon around the Earth. We looked at the names of the phases and will continue with more work on this on Monday. Have a go at this website and test your moon knowledge. 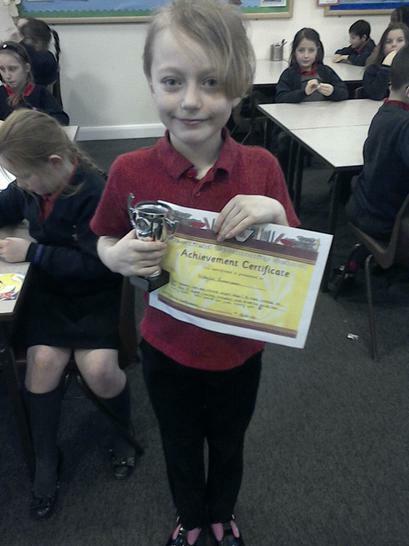 Our certificate winner AND trophy winner this week is Nikyta. This is for being an all round super star. She is always kind, caring, helpful, friendly and always tries her very best. Well done for just being you.